This year, Diamond Partner Unity will return to the GDC expo hall, armed with tools and knowledge that can help attending game developers build better games. To introduce you to them, we reached out to vice president of engineering Brett Bibby for a quick chat about the wide kinds of games Unity is able to support. Could you please introduce yourself and your role at Unity? 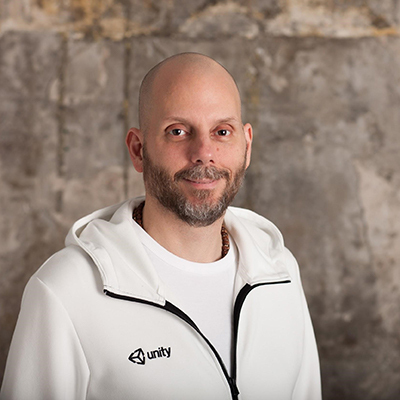 I’m Brett Bibby, VP Engineering at Unity Technologies, heading up the R&D organization that develops Unity. What are some of the technological improvements Unity’s made in the last year that developers should know about? We made great progress on a number of fronts. In terms of core workflows we made and continue to make a number of improvements related to creative tooling such as the Visual Effect Graph. Meanwhile our collaboration with Autodesk has delivered improvements to content import/export and roundtripping capabilities, which helps developers be productive at all scales of development. We also continue to expand the reach for developers with the availability of Project Tiny, which allows making games that are so small they load instantly and run fast. At the other end of the spectrum we made great strides in our Rendering Pipeline to give the most stunning visual results and we unveiled our Data Oriented Technology Stack (DOTS) which enables developers to achieve a level of performance previously not possible. What kind of boundary-pushing projects have you seen using Unity in ways you hadn’t imagined before? ● Return of the Obra Dinn is a PC/Mac game in black and white that is a mystery/puzzle game where you solve what happened to a ship and its crew. ● D.R.O.N.E. is a beautiful PC game built by a small team with an incredible ability to create and share levels, and it really showcases the power of what can be done with Unity. ● Beat Saber is a VR rhythm-action game that uses people’s natural urge to move to music and puts it into a compelling music game. ● Florence is an interesting short-form interactive story on mobile which explores telling stories in a simple yet effective way. ●;And finally I thought Baymax Dreams by Disney is a clever use of Unity’s real time technology. The main story is not in a 3D style but the dream sequences are; innovation in both medium and tools. What kind of questions should GDC attendees bring to the Unity Booth at GDC this year? Unity has been the go-to professional toolset for game developers for years and you may not realize what it’s capable of these days. If it’s been a while since you took a good look at Unity, you should definitely come by the booth and see the incredible strides in graphics, performance, usability and scalability that Unity provides. I would especially ask about why the Data Oriented Technology Stack is so revolutionary, look at the wide array of tools available for everyone on the development team, and how Unity can accelerate your development and reach more players.